Millions of animals are currently in shelters and foster homes awaiting adoption. 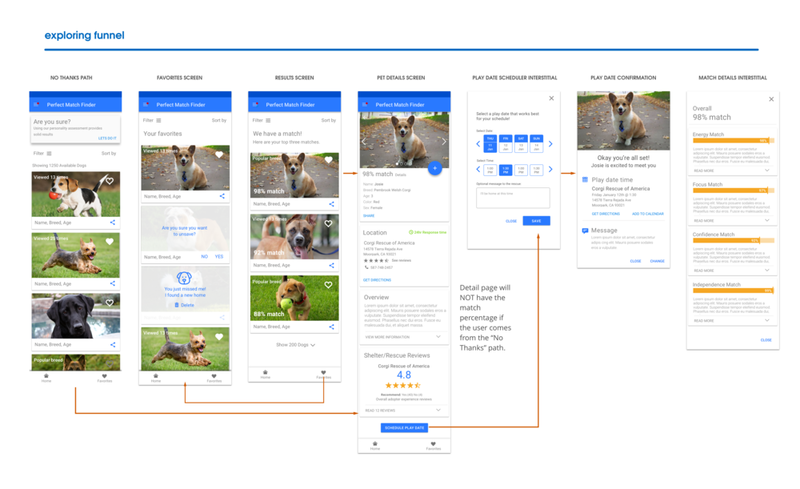 Design an experience that will help connect people looking for a new pet with the right companion for them. Help an adopter find a pet which matches their lifestyle, considering factors including breed, gender, age, temperament, and health status. Provide a high-level flow and supporting wire frames. Adopters want a consumer centric approach to the adoption process that takes their pet preferences into account. 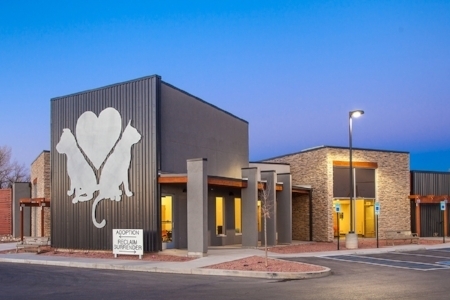 The current process involves driving from shelter to shelter looking for the right pet. If we provide an online resource that sets expectations ahead of the process, the abandonment rate will drop and we'll have more successful adoptions resulting in a reduced number of animals in shelters and rescue homes. As an adopter I need a pet that can live with me comfortably that has a matching temperament. As a shelter/rescue administrator I want to make sure the right pet goes to the right adopter so a pet doesn’t get returned back to us because of incompatibility issues. People that adopt dogs generally look at younger dogs because they live longer. Younger dogs are easier to train, while older dogs are set in their ways. Adopters like the value of adopting from a shelter. The cost of vaccination, spaying and neutering are cheaper than going to a veterinarian. Adopter look for these main temperaments when adopting. The dog should be playful, somewhat smart and obedient, non-aggressive. Shelters get a reputation with adopters. They know which shelters to stay away from. After researching the methods of adoption, rescue's are better at matching pets with adopters. Rescues spend more time with the animals; they get to know their behaviors, likes and dislikes. Part of the discovery phase includes analyzing competitors. Pain point: A majority of sites focused on searching for dog or cat, not really matching to the adopter. In some cases you can filter based on a search criteria but that still doesn't solve the problem of matching the right pet with the adopter. Pain point: There isn’t a clear next steps after going through the online selection process. There is a lot of assumptions. Such as: Are they going to call me? Email me? Schedule a meet and greet? The on-boarding process was more like a profile set-up then a true personality assessment. Pawslikeme.com offers an assessment survey, matching the adopter with the correct dog based on personality traits. Animal and adopter personalities are aligned based on the answers from the quiz that match the four personality quadrants. The results page organize dogs by ranking them highest to lowest displaying the match percentage. I started my ideation phase by fleshing out the initial user flow. This helps define the architecture and uncover uses cases and pain points along the way. You can select the image or the link to view flow. During and after the process flow phase I start forming ideas and lock down the main user funnel on paper. Other use cases won't start to evolve until I'm in sketch. While I'm in sketch I start to think about messaging and interaction in-between the various states. In my research, I noticed that the adoption process is very much an open conversation approach, especially with rescues. They want to make sure the dog is going to a good home. There is a certain level of care going through a rescue that is absent in the city shelters. I can speak with experience for this process having used a rescue when I adopted my Welsh Corgi Brandi. 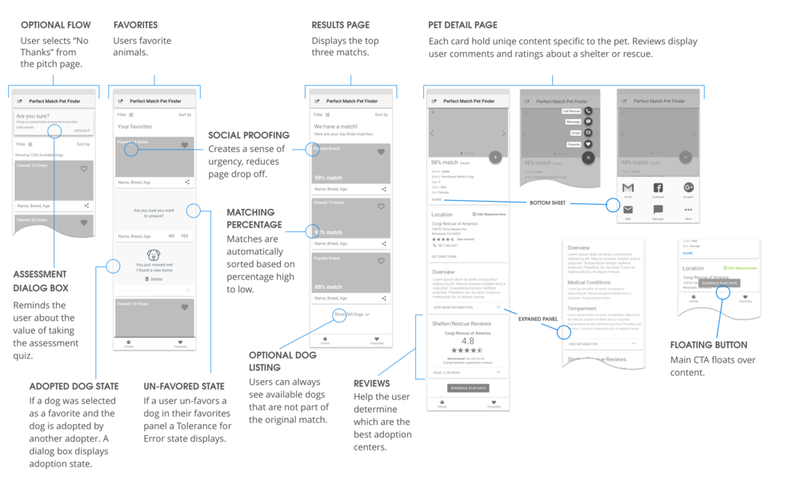 My design tries to mimic this process of having a conversation with the user as they move through the selection funnel and ultimately make a "Play Date". I use language that has a friendly tone as if to hold their hand through the process. I introduced some user-generated content in the form of reviews. I think people generally want to know about these shelters and rescues they're about to do business with. I added social proofing language to create a sense of urgency. I think this is useful in helping to increase conversion within the app. The support for social proofing was revealed during my adopter interviews, one of the participants said they actually lost an opportunity to adopt a dog, waited a day and the dog was already adopted. By injecting social proofing we can create this same sort urgency to adopt. I would have liked to do a card sorting exercise to determine the features that users want and need in this app. A lot of the features displayed were based on my competitive analysis and user interviews. My next step would be to conduct usability testing to validate these features.